turkey & gouda grilled cheese with bacon jalapeño brussels. ooooh hay ho i made this dinner a super long time ago. like 5 months ago on a late summer/early fall's eve. but it is a cozy meal i could eat on repeat. its not reeeaaallyyy a recipe per se, but i think of it as a little extra special grilled cheese sandwich. i think we made this on a weeknight at the end of summer when football season had started. in my mind, football means fall which means grilled cheese and soup (and so many other delicious comforting things). fast forward to now, i'm finally getting around to sharing this dinner and football season is basically over. in other words, grilled cheese and soup are desirable at all times. i have a guest cook here, today. pete! i think he could go into hand modeling. lookit them paws! brussels + bacon + jalapeño. mmhmm. the grilled turkey meat pic is gross, but i had to show the manner in which we crispified the meat. cheesy, mustardy, grilled goodness dunked into some hot, peppery, creamy tomato soup goodness with a bite here and there of crispy, slightly spicy, earthy & flavorful bacon brussely goodness. Heat a large pan or skillet to medium heat. Add the brussels sprouts and water. Cover and let the brussels steam through for about 10 minutes. 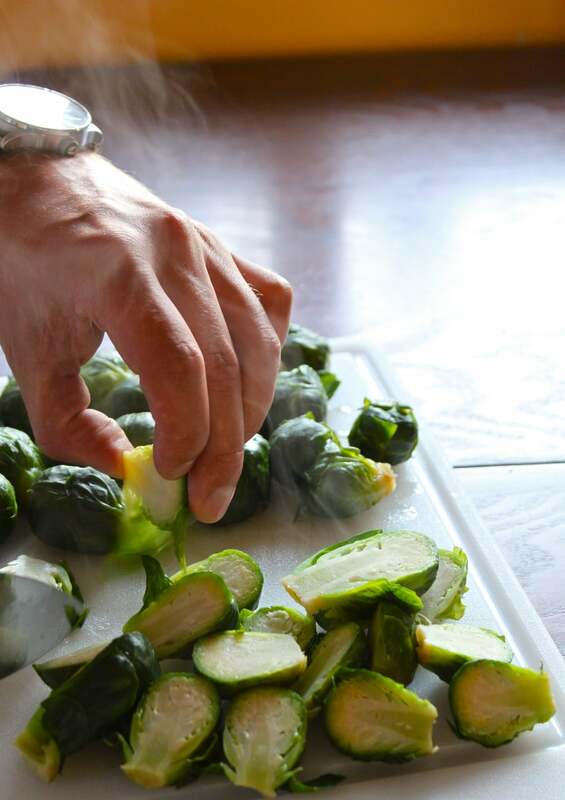 Remove the cover and continue to heat the brussels until the water is evaporated/absorbed into the brussels sprouts. Remove from heat. Cut the brussels in half. Cook the bacon in a pan until tender, not too crisp. Place the cooked bacon between two paper towels to remove excess grease. Chop the bacon into bits. Cut the jalapeño open and remove the seeds. Chop. Add the halved brussels, chopped bacon, and chopped jalapeños back into the skillet on medium-low heat and fold it all together. Drizzle a bit of olive oil and let the brussels brown, turning every few minutes until browned to your liking. Heat the desired amount of tomato soup in a sauce pan on medium-low heat. Add black pepper. In a small pan, heat just a teaspoon of olive oil. Spread the turkey slices in the pan and let them brown on all sides, flipping every couple of minutes. Heat a large pan to medium heat. Butter one side of 4 pieces of bread, and spread 1 TB of brown mustard to the opposite side . Place 2 slices of bread butter side down in the hot pan. Place a slice of gouda cheese and 2-4 slices of browned deli turkey on each piece of bread. Top each sandwich with another slice of bread, butter side facing up. Cover and let the cheese melt as the bread gets grilled & browned on the bottom. After about 3 minutes, turn each sandwich and let it brown on the opposite side for another 3 minutes. If desired, broil an additional slice of gouda cheese on the top of the sandwiches after grilling. 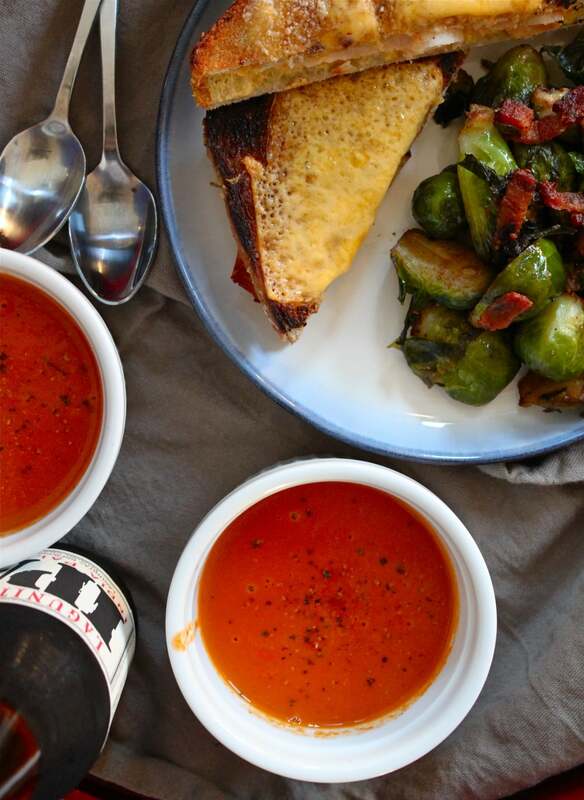 Serve the sandwich cut in half with a cup of tomato soup and a serving of the bacon brussels. With a beer! On a Thursday! or whenever.